2nd Lieutenant Basil Spencer JENNINGS. 14th Battalion West Yorkshire Regiment (Prince of Wales's Own), attached to the 6th Battalion Yorkshire Regiment. Son of Jonathan Sutcliffe Jennings and Hannah Mary, his wife, of Cononley Hall, Keighley. Died 7 November 1915. Aged 25. 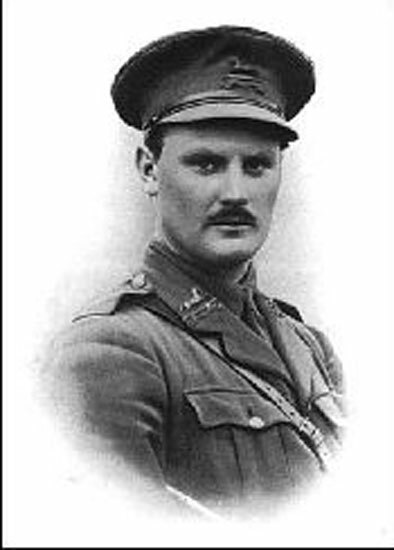 Lieutenant Jennings joined the 6th Battalion Yorkshire Regiment on 29 September 1915 as part of the reinforcements for the battalion that had lost all of its officers and most of its men in August 1915. He died of wounds only weeks after joining the battalion. Photo and additional information from Craven's Part in the Great War, courtesy Chris Foster. 2ND LIEUT. BASIL SPENCER JENNINGS, 14th West Yorkshire Regiment, son of Mrs. J. S. Jennings, of Cononley Hall, died from wounds received in action in Gallipoli, on the 7th November, 1915. Lieut. Jennings, who was 25 years of age, was in Morocco when the war broke out; he returned to England and enlisted in King Edward's Horse, and was afterwards given a commission in the 14th West Yorkshire Regt. He went out to Suvla Bay in September, 1915, attached to the 6th Yorkshire Regiment. He gave his life in a noble deed. On the night of the 5th November, 1915, he went to the trenches to rescue a wounded soldier; he was sniped and died from his wounds two days later. Lieut. Jennings was for some years connected with the firm of P. W. Spencer, quarry owners, Lothersdale. He was educated at Sedbergh, and for a few seasons he played Rugby Union in the Skipton team. This officer and his cousin, Lieut. J. A. C. Spencer, of whom we give a portrait and biography in this book, were grandsons of the late Mr. Peter William Spencer, of Raygill, Lothersdale.